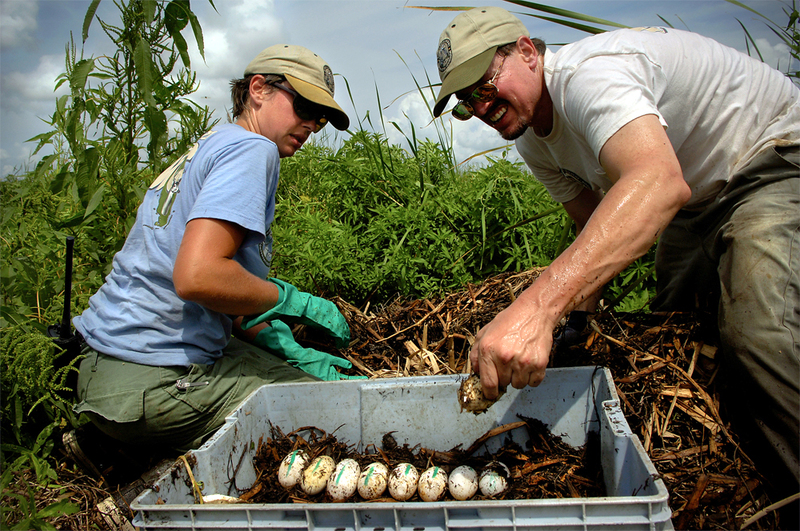 Blair Hayman, left, and Stephen Stiegler carefully collect eggs from an alligator nest in the marsh vegetation on Lake Okeechobee during the yearly public egg collection. The green marks put on the eggs signify that the eggs were found in a dry condition, and because the embryo attaches to the top of the egg, the mark is necessary to maintain that orientation so the embryo doesn't drown in its own fluid. A blue mark would indicate they were touching water and a red mark shows they were underwater. This was a record year for the alligator farmers with 16, 867 eggs collected on the lake alone.